This has been a strange week. I love commenting on others’ blogs and have actually gotten better about it, taking more time to view and read those I love and new ones I come across. But now there is an eerie creature confounding me everywhere I go. My comments will not appear on most Wordpress.com blogs, except on my own. I have no idea what is causing this. Wordpress Support thinks I may have been erroneously flagged as a spammer. SPAMMER?! Akismet says no flag. So where are my comments going? I posted on one WordPress site today (“Yeah!”), but couldn’t on a few others. So, until this is figured out and fixed, I will keep trying. If you’ve seen that I “Liked” your post, but there is no comment, I was blocked by this mysterious creature, who has yet to be caught. Magic Broom is perfect for the child just learning about Halloween witches. The witch seems friendly, given her huge smile, which she keeps even when asleep with her traditional black cat. Actually, the cat looks like a sweet little kitten. Oddly, or maybe not, each time the cat can be seen it seems to look directly at the reader . The cat is not spooky or spooked, but looks as if wondering whom you are and why you are reading about its witch. Definitely a conversation starter. Halloween has arrived and the witch must make her rounds. With a smile on her face, the witch hops on her magic broom and takes flight. Out the front door she zooms on the spookiest night of the year. The moon is full and the stars are shining bright. 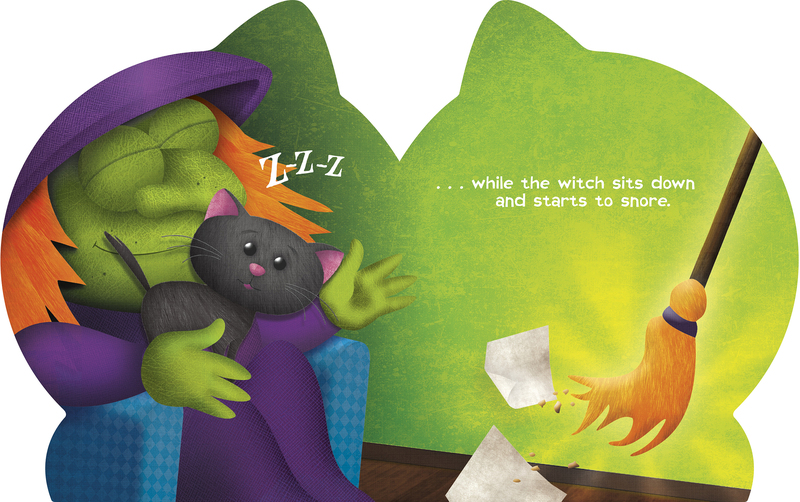 After making her needed rounds, the witch is tired and ready for sleep—a good segue into bidding goodnight to your child. Oh, but the witch’s story does not end with her snores. Her house is a mess but she is too tired to clean. Magic Broom comes to the rescue! It sweeps the floor while the witch catches her Z’s. 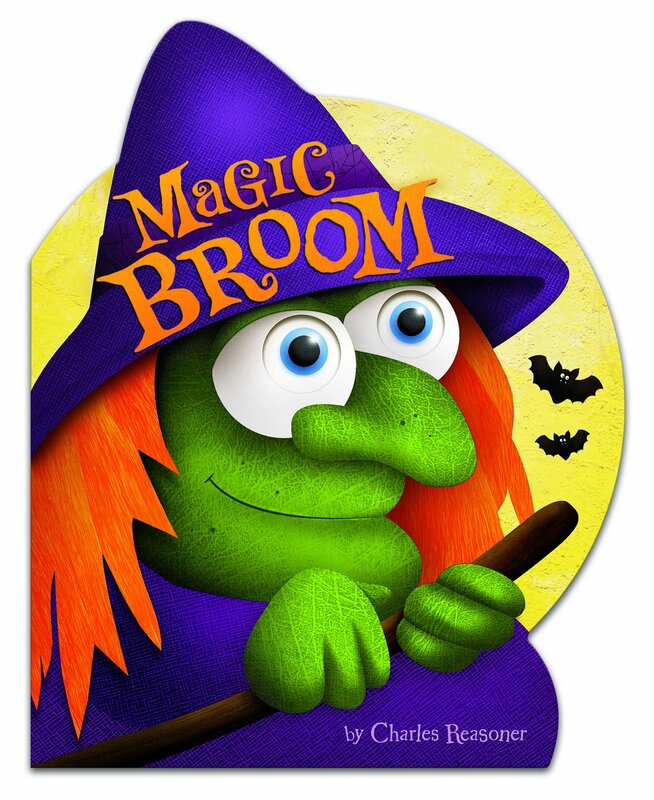 Magic Broom is a thick, oversized board book with nice glossy pages. It is easy to clean off smudgy fingerprints or globs of jelly. Kids will enjoy this light fare about a witch flying around on her broom each Halloween. The lovely, green-faced witch will not scare your child. 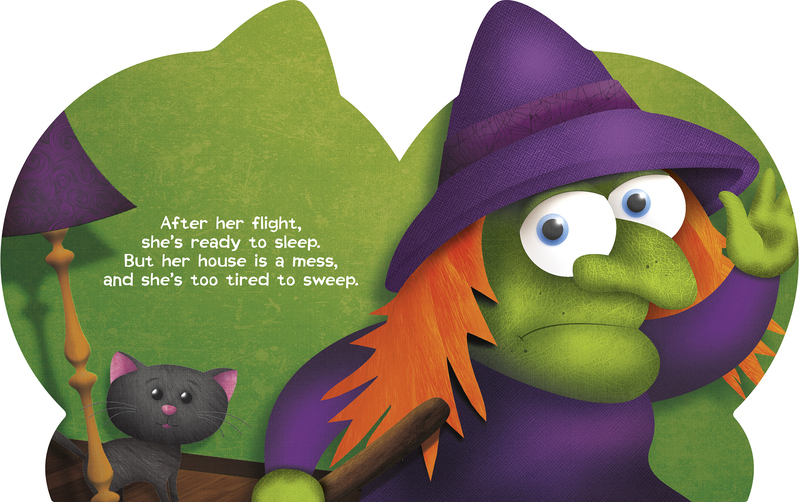 Magic Broom is a nice Halloween book for younger children and makes a great bedtime story. This review would be perfect, if only I could get that magic broom. MAGIC BROOM. Text and illustrations copyright © 2015 by Charles Reasoner. Reproduced by permission of the publisher, Capstone Young Readers, North Mankato, MN. Purchase Magic Broom (the book) at Amazon —Book Depository—IndieBound Books—iTunes Books—Capstone. Learn more about Magic Broom HERE. Also available in a 6” X 6” size. Capstone Young Readers is an imprint of Capstone. Yeah, had a problem for a while there. Askimet fixed it but won’t tell me what went wrong–just that I was not flagged as a spammer. It was frustrating. But it is fixed now. May be several in your spam–I kept trying. Will have to look more carefully because I delete so many without looking. Love the cover on this book — and I like the fact they are all board books for younger children. I have a one-year-old great grandson and this would be a great series. Oh, I think your grandson would love this gentle tale. You might just find me in your spam folder. Now that it is fixed, that should stop. Yep, you were in my spam folder. I accepted your comments, though, though, ’cause I like ya! Yep! There were about six of ’em. I admire your persistence! Sounds like you’ve been cursed with wordpress demons. 😦 This book and the whole series looks like a fun seasonal read. I’d sure like one of those magic brooms, too. Me, too! I would love to have a magic anything, especially when trying to comment. But the magic bug is suppose to be gone for good now.